Pork chops make a great main course because pork works well with a variety of flavor profiles. Cooking pork chops is easy with the right recipe. 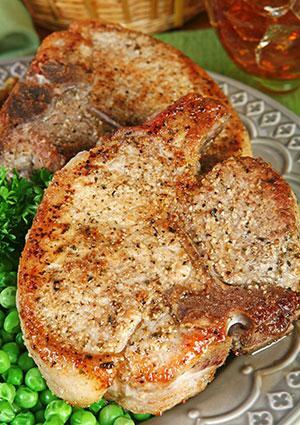 Marinating or brining (soaking) pork chops tends to yield juicy, flavorful chops. Brines tend to be watery and contain a good amount of salt, while marinades are thicker and have very little salt. You can strain and reduce a marinades for use as a sauce, while you must discard the brine after soaking the pork chops. 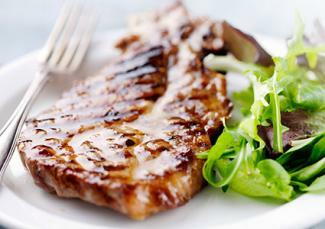 Coating or dry rubbing the chops adds flavor, but the result may be a bit drier than a marinated chop. Of course, you can also use a combination of the two techniques, brining the chops and then applying a dry rub or coating. However, there is a third option. If you cook pork chops low and slow with a little moisture, the collagens will break down when the pork reaches about 190 degrees, making them very tender. This technique is used in the smothered pork chops recipe below. Using a paring knife, make a one inch long cut near the bone on the chop. Gently work the knife into the chop to create a pocket for the stuffing. Try to get as large a pocket as you can without actually cutting through to the outside of the chop. Mix water, brown sugar, and salt in a bowl large enough to hold 6 pork chops. Place the pork chops into the brining liquid. Make sure the chops are completely covered with the brine. Cover the bowl and refrigerate for one to three hours. Remove chops from brine and pat dry with a paper towel. Season with salt and fresh cracked black pepper to taste. In a large bowl, mix the pine nuts and breadcrumbs. Coat the bottom of a large skillet with olive oil and heat over medium heat. Add the spinach to the oil and sauté until it starts to wilt. Add the garlic and cook until it is fragrant, about 30 seconds. Remove from heat and drain the liquids from the spinach using a strainer or colander. Add the spinach to the bread crumb mix along with the cheese. Stir in lemon juice and the salt, pepper, and nutmeg, mixing well. 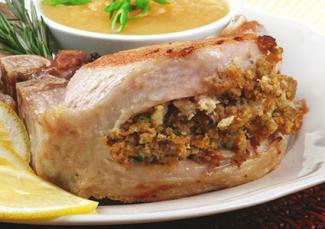 Stuff the pork chops with the stuffing. Using a large skillet, pour in enough oil to coat the bottom. Heat the skillet over a medium high heat. Once the oil is hot, place the chops into the skillet and cook until they are well browned, about three minutes per side. Place the chops on a cookie sheet that has a rack on it and place them into the oven. Cook the chops for 10 minutes, and then flip them. Cook for another five minutes and check the temperature with your thermometer. Continue cooking until internal temperature reaches 145 degrees. Let the pork chops rest for 10 minutes before serving. Whisk the soy sauce, honey, applesauce, apple juice, and brown sugar in a bowl. Add the pork chops and toss to coat. Tightly cover the bowl and refrigerate it. Let the chops marinate for at least four hours, giving the bowl a good shake about every 30 minutes or so. Remove the pork chops from the marinade and place them on a rack on a cookie sheet. You may want to place a sheet of parchment paper on the cookie sheet or cover the cookie sheet with foil to help with clean up. The marinade will be hard to scrub off since there is a lot of sugar in it. Bake the chops at 350 degrees for about 20 minutes. Check the temperature with a thermometer. The chops should be a minimum of 145 degrees. Let the chops rest for 10 minutes before serving. While the chops are resting, strain the marinade into a saucepan. Bring the marinade to a boil for about five minutes to kill bacteria. Dissolve the cornstarch in the cool water. Stir the dissolved cornstarch into the marinade until it reaches a sauce-like consistency. Serve the sauce with the chops. Whisk together mustard, molasses, coffee, garlic, salt, pepper, and ginger. Pour mixture in a large zipper bag. Add pork chops and seal the bag. Shake to coat the chops well. Refrigerate the chops for two hours, shaking the bag occasionally to coat chops. Heat your grill to medium-high. 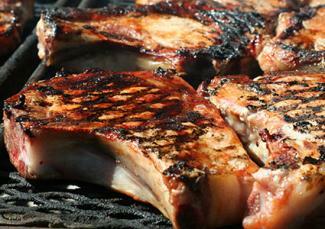 Grill chops until internal temperature reaches 145 degrees, about eight minutes per side. Allow pork to rest for 20 minutes before serving. Combine cumin, pepper, coriander, paprika, brown sugar, and sea salt in a small bowl. Pat pork chops dry and rub with dry rub. Seal in a plastic zip bag and refrigerate for at least two hours, or up to overnight. In a large skillet, heat oil until it is shimmering hot over medium-high heat. Add pork to skillet in a single layer. Cook chops until well browned on both sides, about five minutes per side. Internal temperature should reach 145 degrees. If chops are slightly thicker, you can reduce the heat to medium-low after chops are browned, cover, and cook for about five minutes until they come up to temperature. Allow chops to rest for 20 minutes before serving. Cook bacon in a small saucepan over medium heat, rendering fat. When bacon is crisp, remove it from the fat with a slotted spoon and set aside to either garnish pork later or for another use. Add flour to bacon fat and whisk, stirring constantly until flour is golden, about five minutes. Whisk in 2-1/2 cups of chicken broth. Increase heat to medium-high and boil until mixture thickens. In a large skillet, heat oil over medium high heat until it shimmers. Dry the surface of pork chops and season them liberally with kosher salt and fresh cracked black pepper. Cook the chops in the oil until well browned on both sides (about three minutes per side), being careful not to crowd the pan. Work in batches if necessary. Remove chops from pan and set aside on a plate. Add onions to the oil in the skillet, along with two tablespoons of broth and the mushrooms. Reduce heat to medium low and scrape any cooked on bits off the bottom of the pan with a wooden spoon. Cook until onions soften, about four minutes. Return pork chops to skillet, along with any juices that have collected on the plate. Spoon mushrooms and onions over the top of the pork. Add gravy that has been set aside. Reduce the heat to low and cover the pan. Simmer on the stove top until pork is very tender, about 30 minutes. Remove pork from sauce and allow sauce to simmer for another four or five minutes to thicken. 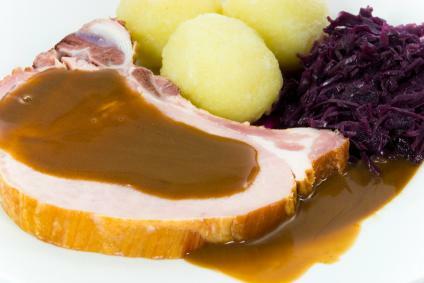 Serve pork topped with gravy. Pork because you can cook up pork chops so quickly and many recipes require very little prep work, they make an easy and quick weeknight dinner. You can also serve them alongside scalloped potatoes and glazed carrots for a weekend meal.